Neoliberal modernisation in Ukraine is nothing new. 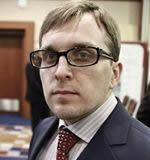 The processes and forces pushing it forward long predate the ousting of Viktor Yanukovych last February. But since the events of 2014, this process has been expedited and has arrived at a key issue: the laws governing the way people work. Employers stubbornly complain that the current code is not flexible enough and regularly hark back to its roots by denouncing it as ‘socialist.’ But even in the late Soviet era, it would have been difficult to call this code ‘socialist’: the 1971 code removed many benefits originally enshrined in the 1922 original. That said, most Ukrainian workers are satisfied with the labour code. But they are concerned only with how it is applied in practice by employers. Meanwhile, most independent trades unions (including the Confederation of Free Trades Unions) fundamentally oppose the adoption of the new code. The Federation of Trades Unions of Ukraine – Ukraine’s largest trade union confederation with 8.7m members – seems to have no strong position. 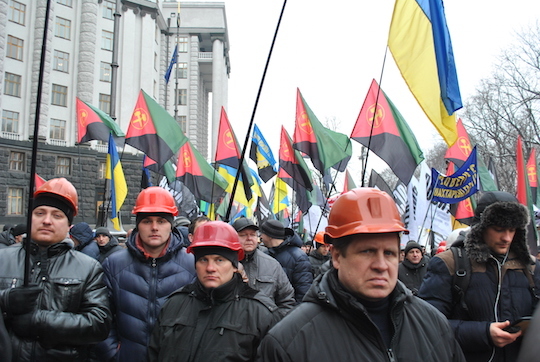 April 2015: Ukrainian miners in Kyiv protest against unpaid wages. (c) Demotix/Yevgen Kotenko. This is not to say the system isn’t flawed. According to statistics of the Ministry of Economic Development and Trade, 85% of employers inspected turned out to be in violation of existing labour laws. In Europe, Ukraine comes bottom of the table of countries where the right to strike is respected (with Belarus, Estonia, and Russia not doing much better). Illegal and general strikes are non-existent in Ukraine. Wages in the country remain incredibly low. And wage arrears continue to rise: they have long passed the one billion hryvnya mark (£31.2m). Approximately half of these arrears concern enterprises that are still in operation. Roughly half of all workers are employed illegally. Discrimination receives far too little attention. One look at the authors of the new code might also key us into its possible outcomes. The developer of the first draft code (№1658) was Mikhailo Papiev, former governor of Chernivtsi and now a Rada deputy from Opposition Bloc (supported by Renat Akhmetov). While Papiev first registered this bill in December 2014,he is now facing the possibility of losing his position due to violations of electoral law in 2012 – a potential criminal prosecution. The employee is deprived of the right to leave until they work off a specific period. Soon, Ukraine’s sole competitive edge in the European market will consist of having the lowest paid workers with the fewest rights. Small business should be stimulated with access to loans, not through the enslavement of workers. Vitaly Dudin is a legal analyst at Ukraine’s Center for Social and Labor Research, which was created in 2013 as an independent not-for-profit institution dedicated to the analysis of socio-economic problems, collective protests, labour relations and conflicts.